Wow, I don't know what's crazier — that there's a Japanese company called Cyberdyne, or the fact that it's creating cyborg limbs that look sort of like 1960s Cybermen. Or maybe the fact that its cyborg limbs are called "Human Assistive Limb," or HAL for short. What's next? The Brilliant Organ Replacement Group? It's like they're announcing that we're doomed. It's bad enough that Skynet already exists. More pics below the fold. 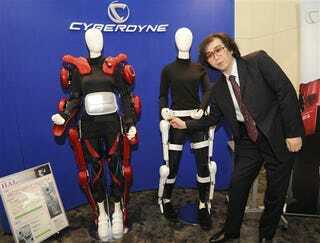 Cyberdyne showed off these HAL robot suits today at the company's new R&D center in Tsukuba City. Mass production of our new overlords the suits will begin Oct. 10. The suits actually read brain signals and figure out how you're going to move, then they assist with motion, for people with gait disorders or seniors. The suits will go for U.S. $2,200 a month, or $1,500 for just one leg. Top image by AP/Kasahara. Other images by Yoshikazu Tsuno, AFP/Getty.